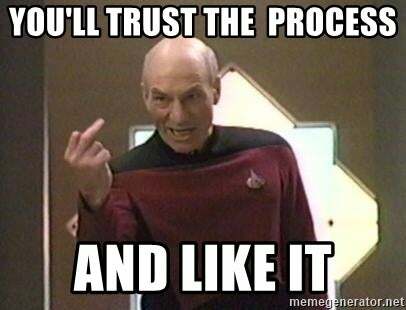 What does Trust the Process mean? 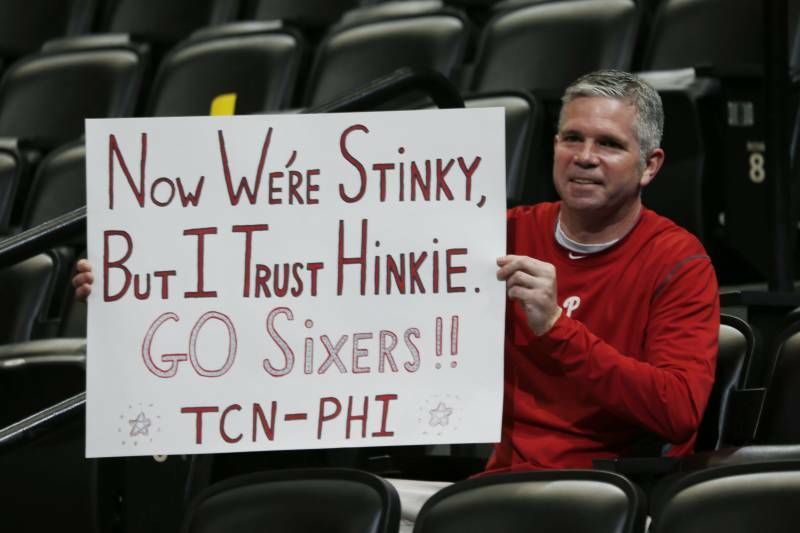 Trust the Process is a slogan used by fans of the NBA's Philadelphia 76ers, though it has since become popular elsewhere in sports and culture. Coined during a rough patch for the team, it basically means "things may look bad now, but we have a plan in place to make it better." Each day is an opportunity to get 1% better. Consistently taking small steps in the right direction leads to big results over time. Trust the process. There has been a lot of upheaval about UCLA football’s recruiting strategy, but fans should trust the process because Chip Kelly has everything under control. Where does Trust the Process come from? Trust the Process actually shows up in a couple of unrelated books well before Sixers fans started saying it. Trust the Process was the title of a 1996 book on addiction recovery and a 1998 guide for artists. In any challenging project, it can help to focus on (trust) what you can control (the process) rather than the outcome. In 2014, Hinkie used one of those draft picks on Joel Embiid, a player who, due to injuries, wouldn’t be able to play that season (and wouldn’t play in the NBA until 2016). Echoing Hinkie, Embiid encouraged fans to trust the process. Again, fans would have to wait for the payoff. Embiid became the player most associated with Hinkie’s process and even adopted The Process as his nickname. Around the same time, baseball’s struggling Houston Astros were also embracing the rebuilding process, selling T-shirts that said Process in the team’s colors. Two Philly fans and podcasters, Michael Levin and Spike Eskin, started making Trust the Process T-shirts. Sportswriter Pablo Torre held up one of the shirts on ESPN’s sports roundtable Around the Horn, bringing the phrase to a national audience. Not everyone at ESPN was a fan of the process, though. Stephen Smith called it an atrocity in 2015 and reiterated his disdain on ESPN in 2017. Admittedly, things didn’t look great: The Sixers had a record-breaking loss streak in 2015, and eventually Hinkie resigned. Had the process failed? Nope. In 2016, the sports news site 12Up named the Sixers one of the six NBA teams with the best young talent, pointing to Embiid among others. In the 2017 season, they went 52-30, finished third in the conference, and went to the playoffs. Even without Hinkie around to see it, it seems like the process is finally paying off. 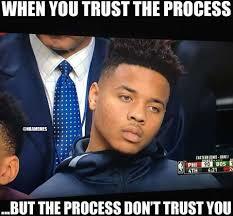 Who uses Trust the Process? It can also mean to focus on what you’re doing and not worry so much about the outcome, something like “stop and smell the roses.” On the other hand, it can mean to stick to the plan and not chase short-term distractions. A writer for the finance website Seeking Alpha compared the planning and patience of stock market investing to Hinkie’s process and urged investors to trust the process. Of course, trust the process remains popular in sports. It has been adopted by players and fans across sports from baseball and football to soccer and rugby—and of course, remains a rallying cry for all things 76ers.